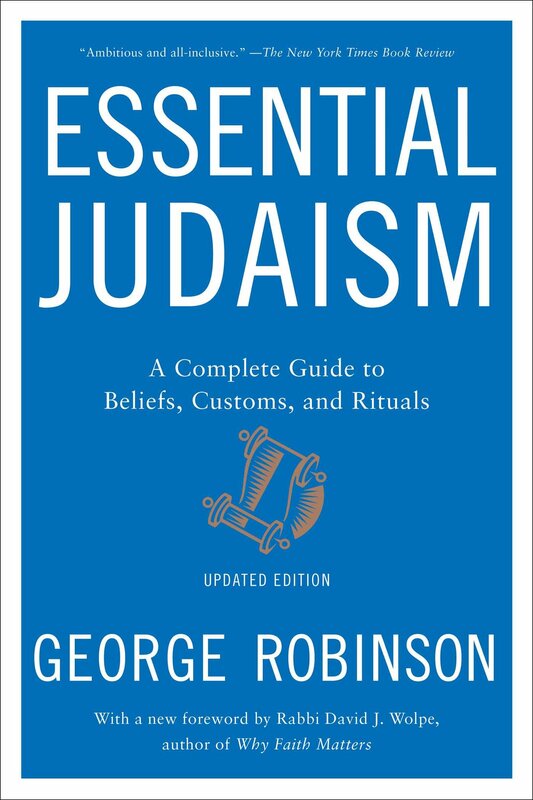 This glossary of Judaism provides definitions of terms related to Judaism, with links to full articles where available. (Hebrew, "A-B"). The Hebrew alphabet. Closing prayer of every synagogue service, proclaiming God's sovereignty. (Hebrew, "going up"). To "make an aliyah" is to be called up to recite the blessing before the Torah reading. Small desk in a synagogue from which the Torah is read. Semitic language closely related to Hebrew. Was once the common language of the Jewish world - the Babylonian and Palestinian Talmuds were both written in Aramaic - but it is no longer spoken. (Acronym for Hebrew aron hakodesh, "holy chest"). Cabinet in a synagogue that holds the Torah scrolls, usually located at the front of the sanctuary. 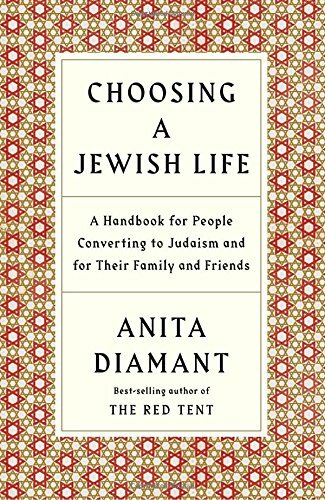 Jews from eastern and northern Europe and their descendents, to be distinguished from Sephardic Jews. (Hebrew, "son of the commandment"). A boy who has reached the age of 13 and is thereafter expected to obey the commandments. Term also used for the ceremony marking this occasion. (Hebrew, "daughter of the commandment"). A girl who has reached the age of 12 and is thereafter expected to obey the commandments. Term also used for the ceremony marking this occasion. (Hebrew, "house of assembly"). The synagogue. (Hebrew, "house of study"). A place designated for the study of sacred texts, usually a part of the synogogue. (Hebrew, "house of prayer"). The synagogue. (Hebrew, "son of"; Aramaic "bar" or "ibn"). Son of. Used in traditional Hebrew names; e.g., Rabbi Moses ben Maimon is Moses, the son of Maimon. (Hebrew, "house of judgment"). A rabbinal court convened to resolve business disputes, grant divorces, determine whether a prospective convert is ready for conversion, etc. (Hebrew brit, "covenant"). Colloquial name for the ritual of circumcision, from the Ashkenazi pronunciation of brit. (Hebrew, "covenant"). The special covenant between God and the Jewish people. (Hebrew, "covenant of circumcision"). The ritual of circumcision performed on the eighth day of a boy's life. More commonly known as brit. "Common Era" or "Christian Era." Designation of years used by Jews and others who wish to avoid the affirmation of faith embedded in AD (Latin anno domini, "in the year of our Lord"). Nine-branch candlestick used on Hanukkah. More commonly, though not accurately, called a menorah. (Hebrew, "holy society"). In Judaism, volunteers who care for a body and prepare it for burial. Commandments that have no known reason behind them. (Hebrew, "canopy"). Also spelled huppah. Canopy under which the Jewish marriage ceremony takes place, representing the marriage chamber or the couple's new home. The term is also used colloquially for the marriage ceremony as a whole. Arrogance, guts, presumption. Generally meant positively. (Hebrew Sefirat ha-Omer). The counting of days between Passover and Shavuot. (Hebrew, "the daily page"). Program of studying one page of Talmud per day. The modern scholarly hypothesis that the Torah was written by four distinct authors, identified as J (for "Jehovah"), E (for "Elohim"), P (for "Priestly"), and D (for "Deuternomist"). A fifth, believed to be the editor of the other authors' works, is known as the "Redactor." A festive meal following the fulfillment of a mitvot, such as circumcision. (Hebrew, "eminence, excellence"). Title given to the head of the Babylonian academy and later to distinguished Talmud scholars in the 6th to 12th centuries. (Hebrew, "completion"). Commentary on the Mishnah. The Gemara and the Mishnah constitute the Talmud. Divorce decree granted by a bet din. Rabbinic law designed to prevent accidental violation of a mitzvah. (Hebrew, "transmigration"). The Jewish doctrine of the transmigration (reincarnation) of souls, taught by the founder of Karaism and found also in kabbalistic writings. (Hebrew, "nation"; Yiddish, "Gentile"). Non-Jew. Sometimes used pejoratively, but the word itself is not negative. Portion of the Prophets read in synagogue services. (Hebrew, "discourse" or "telling"). Non-legal material in the Talmud and Midrash, including stories, legends, theology, and sermons. (Hebrew, "the walk"). Jewish Law. Consists of the 613 mitzvot of the Torah plus rabbinic law and custom. Psalms 113-118, recited at the end of morning service on festival days. (Hebrew, "The Name"). God. Used especially by Orthodox Jews to avoid saying a name of God. Evening prayer for God's protection while sleeping. (Hebrew) The "seal of approval" on kosher foods. Jews living outside of Israel. Prayer proclaiming the greatness of God. Used as the mourners' prayer but also at other points in the liturgy. (Hebrew, "fit"). Fit for ritual use. Also a verb meaning "to make a food or object fit for ritual use." (Hebrew, "fitness"). Jewish dietary laws. (Hebrew) Disc-like head covering. Known as yarmulke in Yiddish. (Hebrew, "All Vows). Famous hymn sung during Yom Kippur releasing Jews of all religious vows made in the previous year. Anglicized form of Hebrew kasher ("fit") indicating a food or object fit for ritual use. (Hebrew, "To life"). A Jewish toast. (Hebrew, "the holy tongue"). Hebrew. Interwoven branches of palm, willow, and myrtle used in the Sukkot celebration. (Hebrew) Rabbi trained to certify foods as kosher. (Hebrew, "unleavened bread"). Also spelled matzo or mazzah. Unleaved (non-yeast) bread used during Passover based on Exodus 12:39, in which the Israelites fled Egypt with only unleavened bread because they could not wait for the dough to rise. Called the "bread of affliction" based on Deuteronomy 16:3. (Hebrew, "good planetary influences "). "Good luck." Usually said at the end of a wedding or upon hearing good news. (Hebrew, "candelabrum"). A seven-branch candlestick. Part of the furnishings of the tabernacle in the wilderness and the Temple in Jerusalem. In 1948 it became the official symbol of the State of Israel. Often used to refer to the chanukkiah. (Hebrew, "doorpost"). Small parchment of Torah verses placed on the doorpost of Jewish homes in obedience to Deut. 6:9. (Hebrew derash, "sermon"). Stories, sermons, parables, and other material explaining the Talmud. Body of natural water used for ritual cleansing. Quota of ten adult Jews required for certain prayers and observances. (Hebrew, "a teaching that is repeated"). 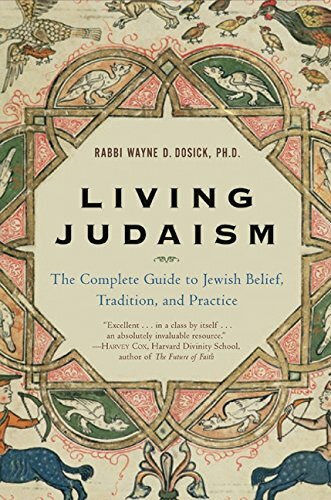 Rabbinic commentary on the Torah and part of the Talmud. Codified c. 200 CE by Judah Ha-Nasi. (Hebrew, "repetition of Torah"). The book of Deuteronomy or, more commonly, the code of Maimonides. (pronounced "MOY-el"). The person who performs the ritual of circumcision. Must be an observant Jew trained in the applicable Jewish law and surgical technique. (pronounced "neh-vee-EEM") (Hebrew, "Prophets"). Second section of the Tanakh, containing the writings of the prophets and history covering roughly 700 years after Moses. The "World to Come" - the Jewish afterlife. The Mishnah. According to traditional Jews, part of the Torah received by Moses at Sinai but not written down until c. 200 CE as the Mishnah. (Yiddish, "neutral"). Kosher foods that contain no meat or dairy and therefore may be eaten with either. (Hebrew, "lots"). Festive holiday in the early Spring celebrating the story of Esther and Mordecai with costume parties and plays. (Hebrew, "teacher"). Jewish spiritual leader. (acrostic for Rabbi Moses ben Maimon) Maimonides. The "Jewish godfather": the man who holds the baby boy during the rite of circumcision. The Temple in Jerusalem that was rebuilt in 516 BCE after the Babylonian Exile and destroyed by the Romans in 70 CE. Jews from the Middle East and Spain and their descendents. Jewish greeting meaning "hello," "goodbye," or "peace." The presence of God; the Holy Spirit. In Kabbalistic thought, the feminine aspect of God. (Hebrew "names"). The Hebrew name for Exodus, the second book of the Torah. Grave; world of the dead. (Hebrew, "guards"). In Judaism, those who stay with a body prior to burial so that it will not be left alone. (Hebrew, "order"). Prayer book used in Jewish liturgy. (Hebrew, "rejoicing"). Any Jewish celebration. (Hebrew, "Booths"). Eight-day autumn festival commemorating the Exodus and celebrating the harvest. (Hebrew "teaching"). The Oral Torah: a collection of rabbinical writings that interpret, explain and apply the Torah scriptures. Consists of the Mishnah and the Gemara. (acronym for Torah, Nevi'im and Ketuvim). The Jewish Bible. (Hebrew, "613 commandments"). The 613 commandments given in the Torah and enumerated by Maimonides. (Hebrew, "torn"; also spelled treyf or treif). Food that is not kosher and may not be eaten. The healing of the world; world peace; social justice. (Hebrew, "Law"). The first five books of the Jewish Bible. Also known as the Five Books of Moses or the Pentateuch. (Hebrew, "torn"). Food that is not kosher; prohibited. Also spelled "terayfa" or "treif." (Hebrew, "hand"). Pointer used to read the Torah, usually in the shape of a hand with a pointed finger. (Yiddish, "annniversary"). Anniversary of a loved one's death. (Yiddish; kippah in Hebrew). Male head covering. The human inclination towards evil. The human inclination towards good. (Hebrew, "I am" or "I will be"). Sacred name of God as revealed to Moses. Also known as the Tetragrammaton. It is considered too holy to be pronounced, and is usually replaced by Adonai in Torah readings. The language of East European Jews and their descendents; a combination of Middle High German, Hebrew and Polish. Members of a historical Jewish movement characterized by armed rebellion against Roman rulers. A modern political movement with the aim of creating a Jewish state. The major text of the Kabbalah movement. 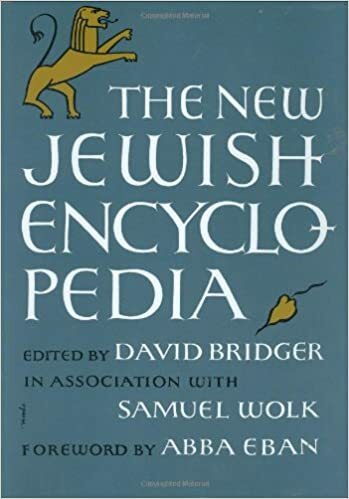 The New Jewish Encyclopedia. . 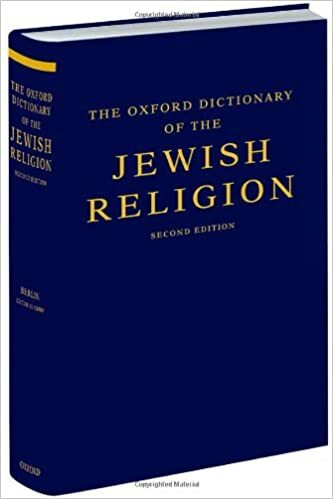 The Oxford Dictionary of the Jewish Religion. . 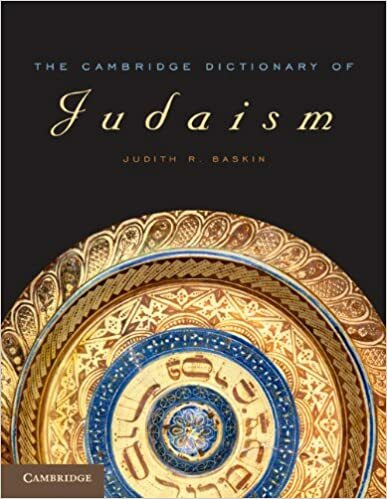 The Cambridge Dictionary of Judaism and Jewish Culture. .
De Lange, Nicholas. 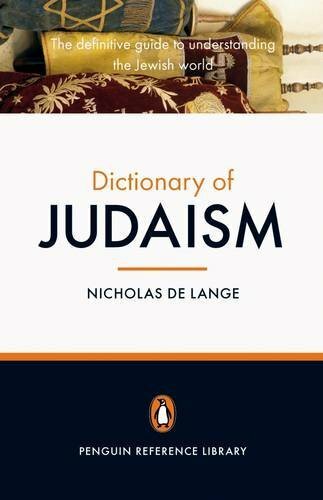 The Penguin Dictionary of Judaism. Penguin Books, 2009.